Recently Bob Howell sent me a link to the page of John Volanthen. I contacted John if I could add some information about his very special rig to my pages. He not only allows me to use his material, but also explained some of his ideas. 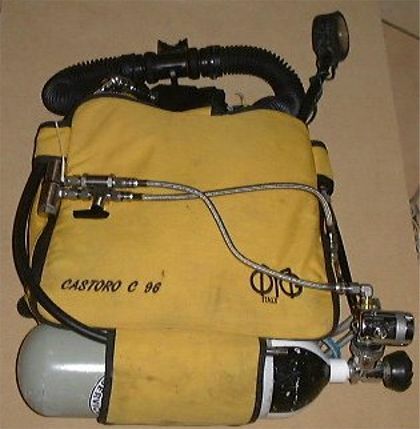 You will find photos and information about his very special Castaro C96 rebuild oxygen rebreather! I am a cave diver, most of my diving is in the UK where the caves are either fairly small or unsuitable for a back mounted rebreather, or in Europe, where to achieve a good safety margin on long dives with a single rebreather would require staging many bail out tanks before the main dive. 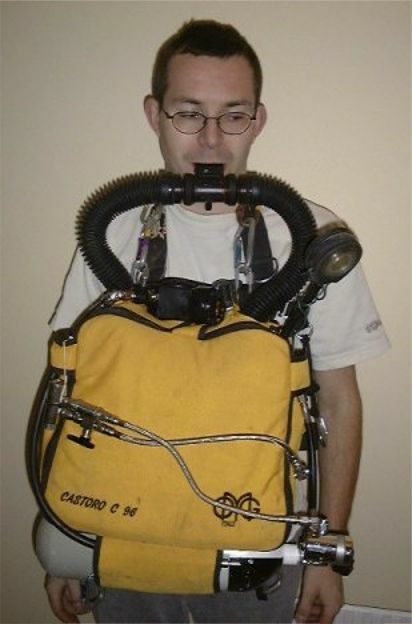 I have not found a chest mounted rebreather commercially available at a reasonable price, and so needed to make one. I am not capable of "home building" a rebreather, this unit is assembled completely by adding tested working parts onto the very good C96 body. I have modified this C96 to operate in 2 roles. As a primary rebreather for use in the UK, and as a bail out rebreather for use with an Inspiration in large French caves. It Fully closed and is capable using of nitrox or trimix diluents, which can be provided from side mounted tanks. Oxygen addition is via a KISS restrictor, this limits the depth the unit can be used in fully closed mode to less than 70M, although it can be used in semi closed mode below this depth. A standard APEX 1st stage is used, with a Delrin® plug inserted to force the pressure setting to be absolute, instead of relative. This allows the constant mass orifice to function correctly. When the unit must carried underground ( to reach a sump ) the ADV is removed and the port is either blanked off or filled with an extra O2 sensor (connected to a VR3). In "bail out" mode, the ADV keeps the loop at ambient pressure, adding or venting diluent as required. This is the front View, The original O2 cylinder has been replaced with a DIN version, I have a dumpy 3L cylinder for resurgence use and lighter 2L for cave carries. The C96 has 4 reinforced areas on the sides for cutting holes in .The original O2 inlet has been moved from the middle of the right hand side to the bottom right hand side. 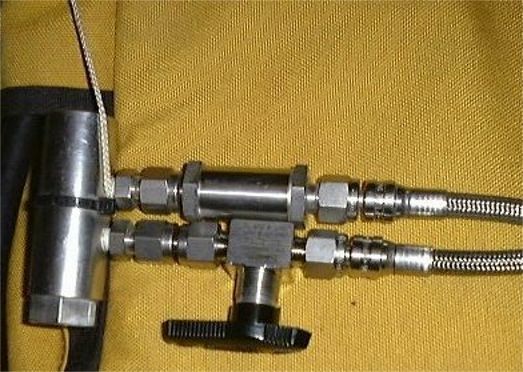 The fitting is 3/8 UNF, which makes connecting gas feeds easy. Gordon Smith supplies fittings to convert from 3/8 UNF to Swagelok®. I have added an inspiration dump valve on the lower right hand side, an inspiration inflator on the center left hand side and 2 Dräger "P" connectors on the center right and at the top. 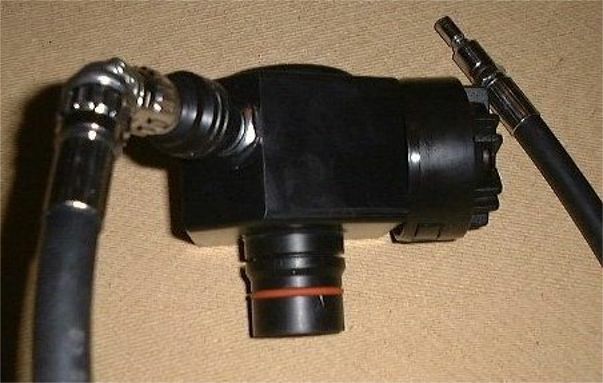 The side "P" Connector is used for the oxygauge, the top "P" connector is used for either an ADV unit, see below, or a second ppO2 monitor (VR3) I have added the KISS O2 injector to provide some level of "automatic" O2 addition. This is a standard KISS Oxygen addition system, with a Swagelok® tap added. When the unit is used in "Bail out" mode this tap is turned off, this keeps the injector pressurized and water free, without continuous oxygen injection. The KISS System is at present depth limited to about 70m, I am intending to change the restrictor to increase the depth capability of the unit. 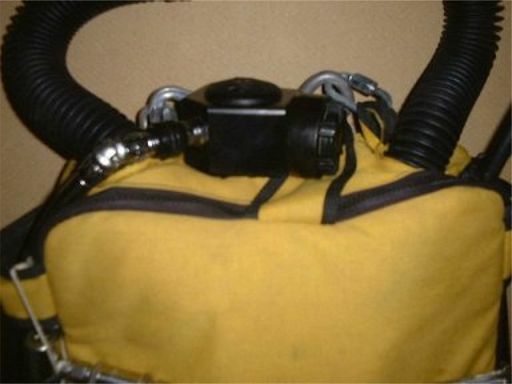 The Top of the rebreather is shown here. You can see the ADV unit. This is a modified version of Bob Howell's Inspiration ADV. It has a "P" connector on the bottom to fit into the bag and a dump valve on the top. With the dump valve fully open, this will keep the bag empty, but at ambient pressure. For "intentional use" or carrying the unit underground, the ADV unit can be removed and replaced with a second O2 monitor. Diluent is then added using the manual injector on the Left hand side. All fittings are inspiration compatible. As shown, The ADV is completely removable, note the inspiration fitting on the end of the hose. These fittings are not suitable for O/C use as they are designed to restrict the flow of gas severely, however for a descending rebreather diver needing a "loop top up" they work fine. 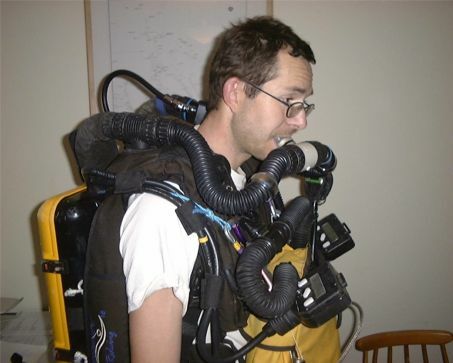 The unit can be worn on a standard Dragon cave diving harness with sidemounts, or mounted over inspiration counterlungs. Note the hose from the ADV running round the right hand side of the unit, to be connected to a female inspiration hose on my side mounts. Here you see how the unit mounts on an inspiration. It's big, but it will take me a _long_ way into a cave without the need to stage bail out O/C. I'd also argue that it's smaller than a DIR Diver with 6 stages and a set of doubles :-)) and of course, the inspiration can be removed and the smaller CCR used on it's own further into the cave if needbe.